It has been a long two months fostering Arthur, who continues to challenge my nerves, patience and upper body strength on a daily basis, but it has also led to an increased understanding of dog behaviour through research into different training methods and approaches. 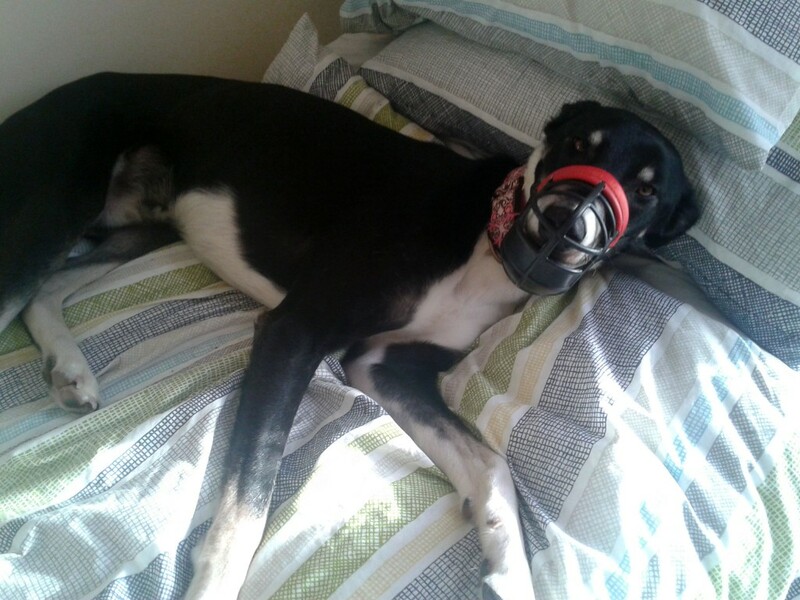 He continues to show a great deal of dog aggression towards any dog outside, and has recently increased in aggression towards any strangers, which can make walking down the street an interesting experience to say the least! Today I discovered a very useful acronym that describes him and many other similar dogs, DINOS or Dogs In Need Of Space, a term coined by the blog notes from a dogwalker for any dog that requires some extra space while out walking, due either to fear, illness, reactivity or occupation. Arthur could be their spokesdog, as he needs a wide berth on all walks, including today, when we waited in the alley to allow a man in a wheelchair and a woman with a baby stroller pass along the footpath as we were on our way home, to prevent the type of barking, lunging, snarling incidents that have happened in the past. Arthur’s fear aggression makes him think all other dogs and humans in the world are out to eat him, so he’s going to eat them first, and at only 18 months old, he also has a bit of adolescent attitude along the lines of “you’re not the boss of me!” with no self-restraint or control. In his previous home, he doesn’t appear to have been socialised with other dogs or taught any boundaries, so we are constantly working on these things, but it is slow progress. 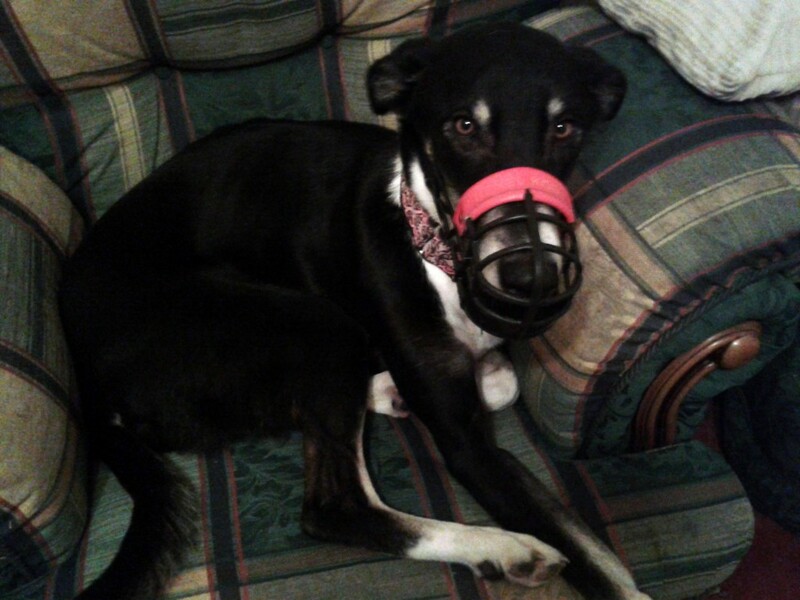 He is getting better with the cats, but is still inclined to chase so he has to keep the muzzle on inside the house, and outside as well to prevent any injuries to other people or animals. One saving grace is that he has never, ever shown any aggression towards myself and he can be very sweet and loving, so I just need to convince him to show that face to the rest of the world. We also have an appointment with the vet next week to draw blood (under sedation) for a thyroid test. There is a possibility that if Arthur’s thyroid is out of whack, it could be causing a lot of his aggression (this is especially true with Huskies, which we have discovered is part of his genetic makeup) and if this is the case, it can be treated and controlled quite inexpensively with medication. His sudden increase in volatility towards people without any incident or trigger leads me to think that there may be something chemically amiss in his brain, and I don’t want to be blaming him for something he can’t control. Of course, even if it is a medical issue and we get the thyroid levels stabilised, there will still be a process of reversing some of the conditioned behaviour that he has learned in the past so that he can be more confident in the world. And he will always be the King of the DINOS! Welcome to Team DINOS King Arthur! His Royal Highness says thanks and we enjoy your blog!